Based in Edinburgh we travel to London frequently and often choose take the train over flying so Kings Cross is always our arrival point in London and every time without fail I always get a wave of excitement when I step out of Kings Cross Station and know I’m off on an other adventure around the capital. 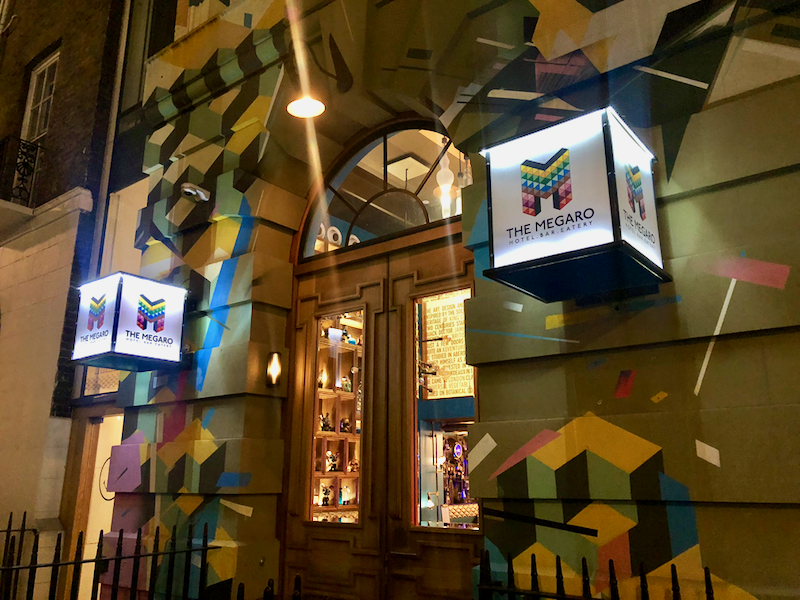 One building that has always caught my attention at Kings Cross is the beautifully colourful Megaro Hotel, so on our latest trip to London, we thought we would find out more about this super cool boutique hotel, so read on to read our review. 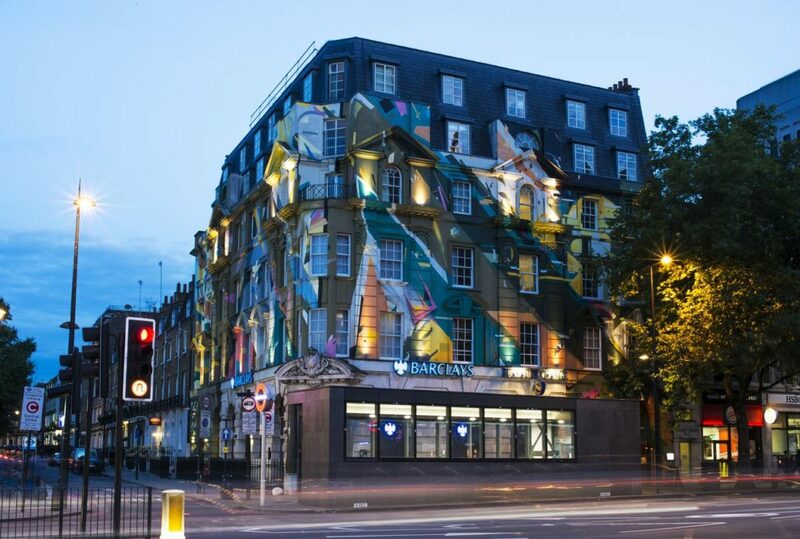 Instantly recognisable and now somewhat of a landmark at Kings Cross thanks to its one of a kind 450 square meter graffiti mural across the classical Georgian facaded frontage, the Megaro is a real head turner. The hotel is independently run and integrates, design, fashion, cinematography and music together with a big dose of British pop culture! Enter through the reception at the side of the property which is a lobby/bar called the ‘Minimix’ where hotel guests can help themselves to snacks and cocktails. 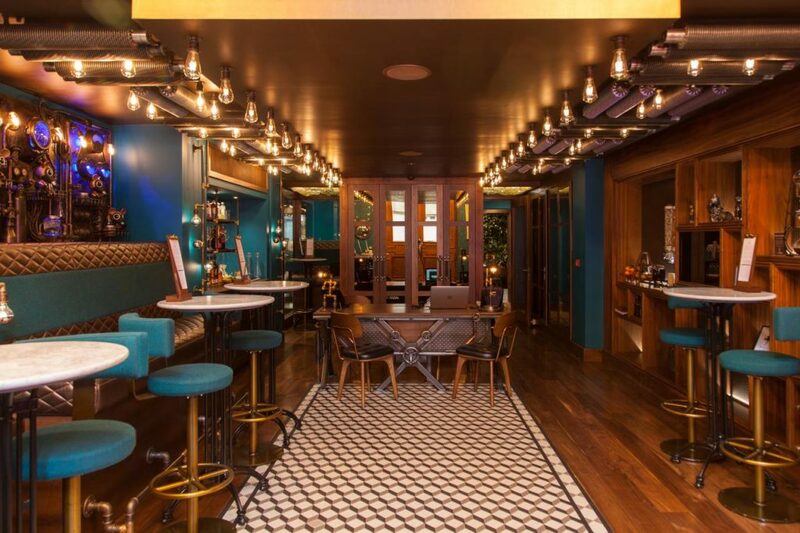 Connecting on the other side of the hotel and facing Kings Cross Station is the hotel’s restaurant The Eatery serving a selection of International cuisine using British sourced ingredients. 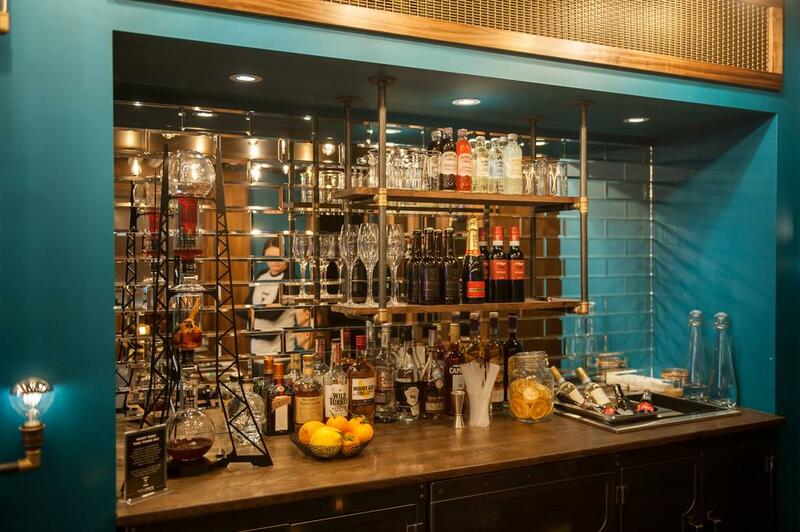 Downstairs is the hotel’s underground Megaro Bar, which is a speakeasy piano bar and a favourite with locals and after work drinkers. 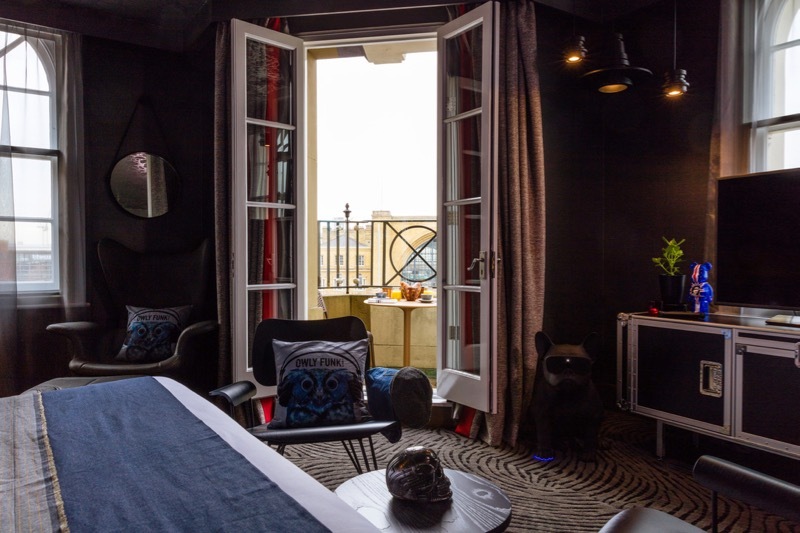 Rooms in the hotel are split into Megaro Rooms and the newer Design Rooms. Megaro Rooms follow a more contemporary classic style of hotel room, while the Design Rooms have a serious dose of cool about them! The new design rooms are grouped into four themes that have a link back to British history. Britannia Rose rooms blend modern design and pop art with the world of wine for which Britain has been a key trading hub for centuries. Each room has a warm, dramatic design scheme in five shades of red and pink inspired by classic red grape varieties: Cabernet, Merlot, Pinot Noir, Sangiovese and Tempranillo. 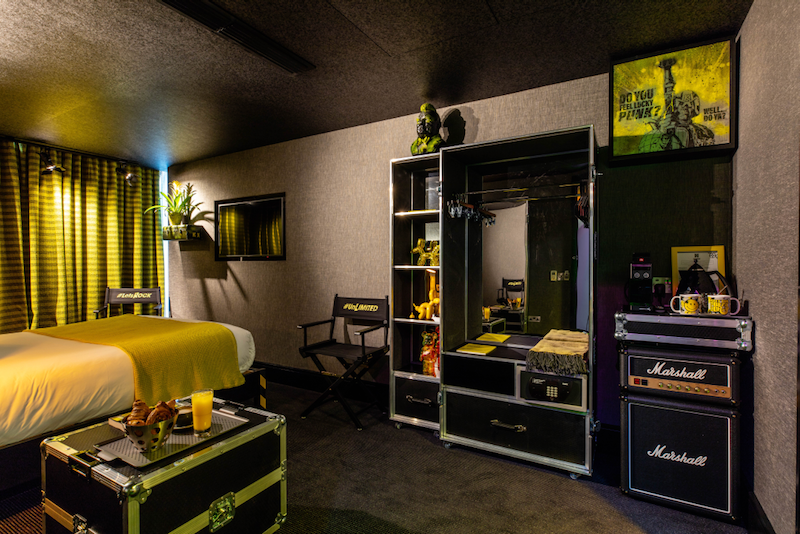 The Corner Studio by Diesel Living rooms are fit for a rock star. 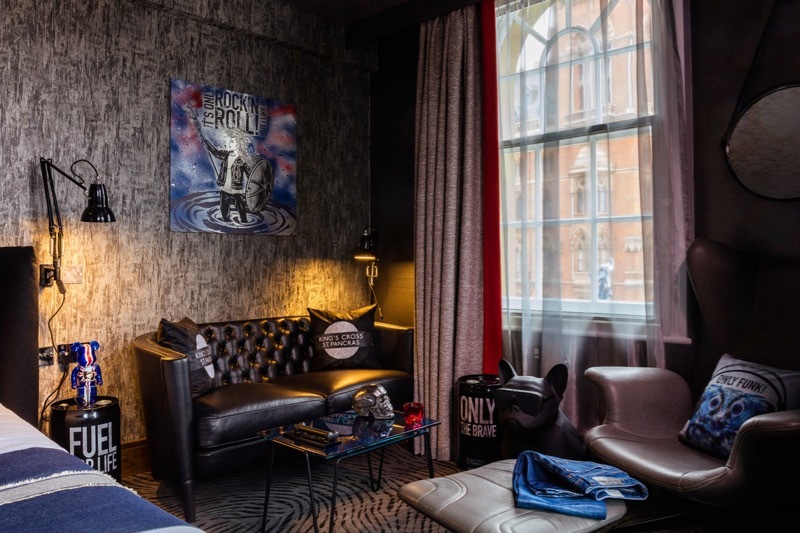 Designed by British artist, Henry Chebaane, three corner studios have been transformed into a ‘Hip Hop Britannia’ style featuring Diesel Living furniture and pieces of British culture such as Harry Potter’s owl and the British bulldog. 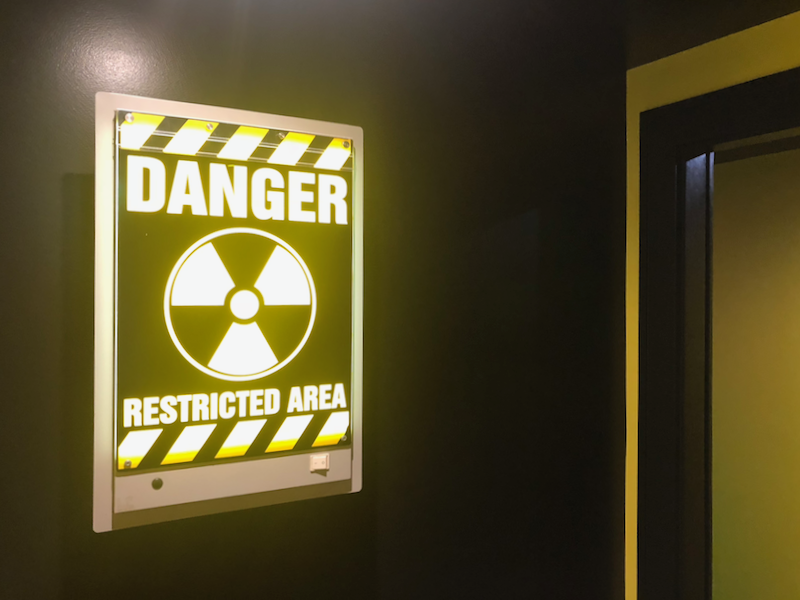 Each generously sized studio apartment has been decorated differently, bringing another aspect of rock ‘n’ roll with it. 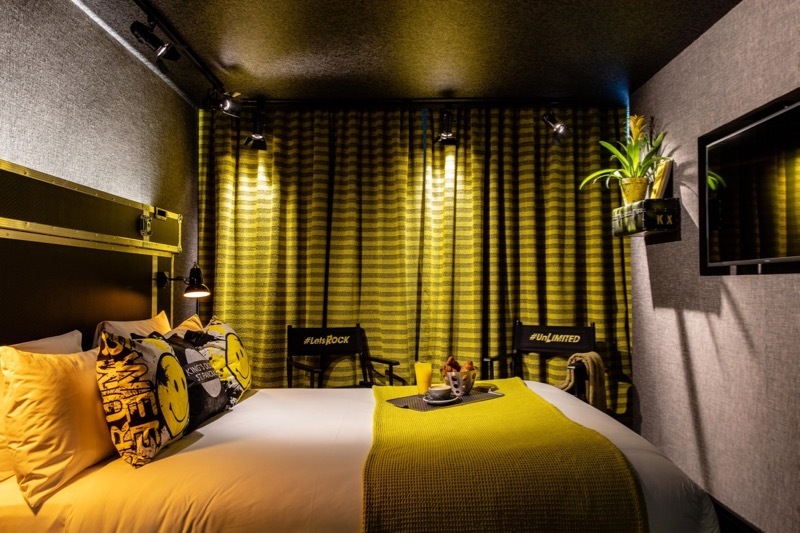 Boasting names such as Scarlet Punk, Plum Rock and Toffee Techno, the rooms feel more like nearby Camden than St Pancras. 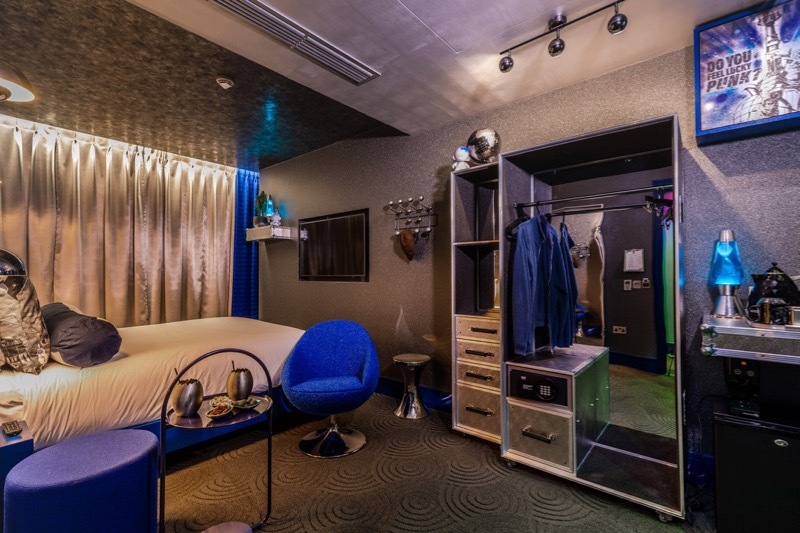 The design of these rooms takes a retro-futuristic trip to the Pop culture of London circa 1968-78 blending visual cues taken from BBC early science fiction and the French Barbarella “ Queen of the Galaxy”. 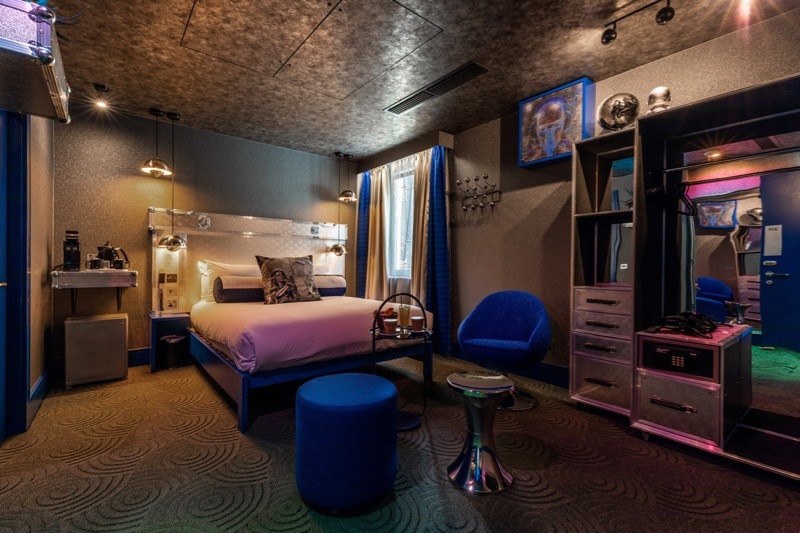 Each room provides a theatrical space-age mood reminiscent of a Dr Who film set. The walls and ceilings are covered with highly specular textured surfaces in shades of silver, reflecting the ambient lights in playful angles. 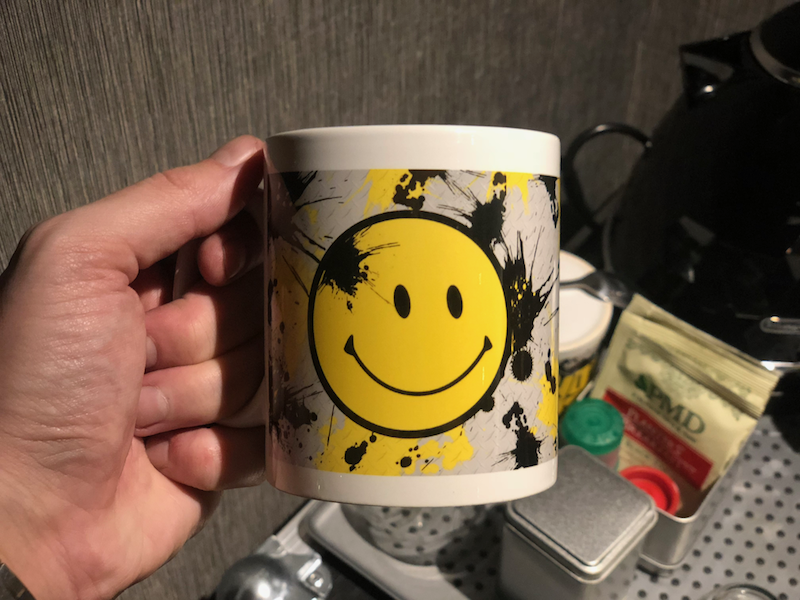 Re-imaging by British artist and designer Henry Chebaane brings a rebellious edge and light-hearted homage to the punk rock music heritage of Camden blended with the Acid House scene of King Cross that was once prevailing within the disused warehouses of the neighbourhood. 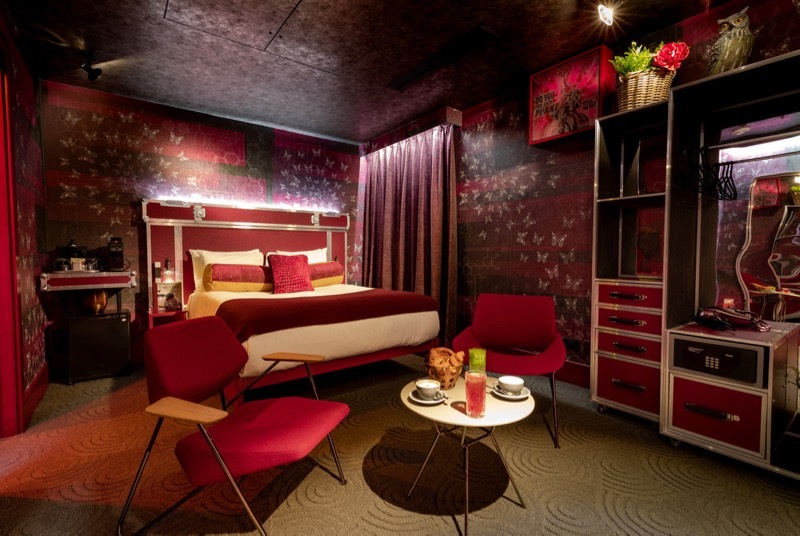 These rooms aim to plunge hotel guests within a deeply immersive, theatrical universe that seems straight out of a graphic novel. 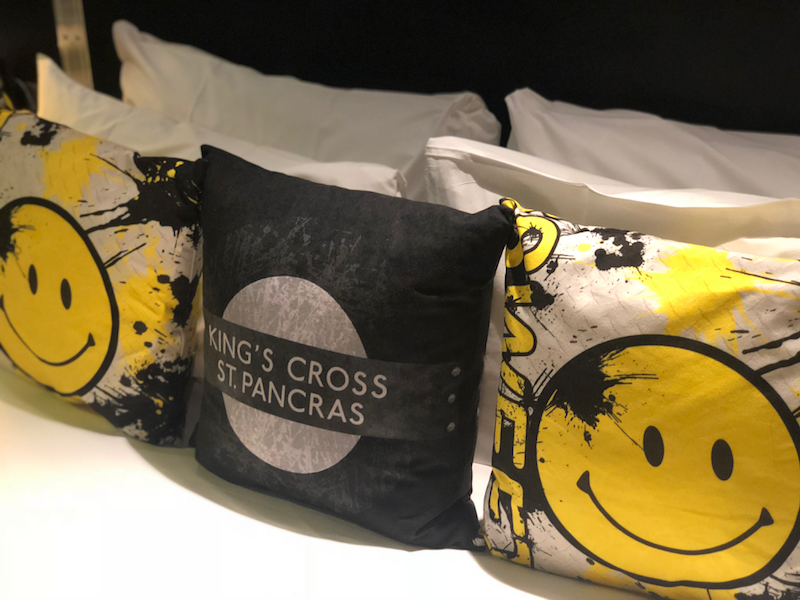 Directly across from Kings Cross Station and seconds away from St Pancreas Station, the hotel is ideal for anyone with a train connection, but Kings Cross isn’t just about its famous stations, you are slap bang in one of London’s most happening districts. This area has seen a renaissance in recently years with multimillion pound developments like the Coal Drops Yard bringing with it new bars, restaurants and shops. 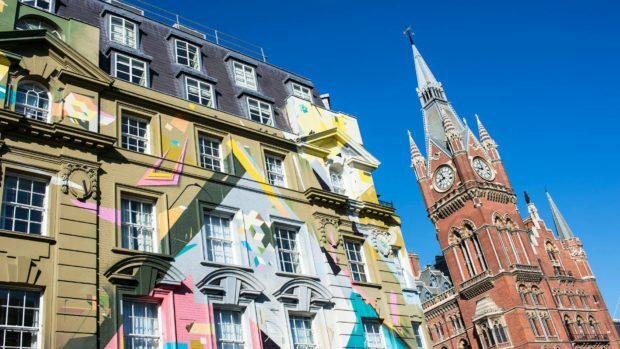 The area is great for culture vultures out there, with numerous outstanding clubs and music venues nearby as well as the British Library on your door step and the British Museum a short stroll away too. 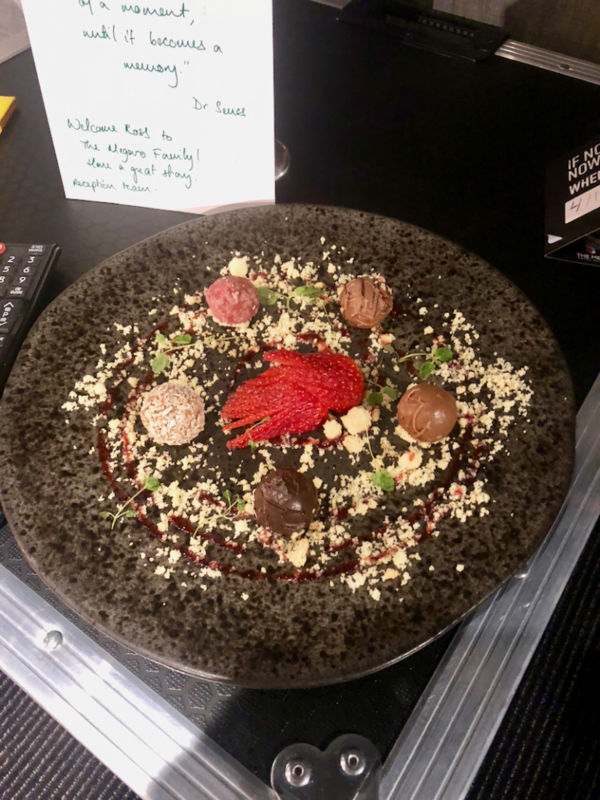 A check in is a check in at most hotels so they can sometimes blend into one, but the staff member at the Megaro was so helpful when I checked in he deserves a special mention. I had just arrived at the hotel and moments earlier my iPhone had crashed, it wouldn’t turn off or reset and I was in a state of distress! I just happened to mention the predicament to the receptionist and he so kindly managed to find online how to reset the phone. With a few special pushes of buttons on my phone it had reset and I was back in business. After my drama with the phone now over I was shown up to my room, I had chosen one of their new suits the “Backstage Britannia”. 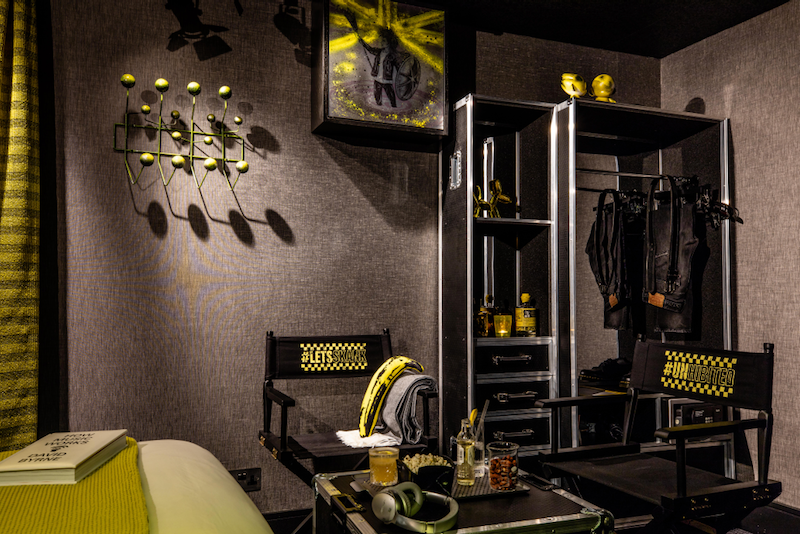 From the four options of the design rooms, I went for Backstage Britannia, which are the latest addition to the hotel. 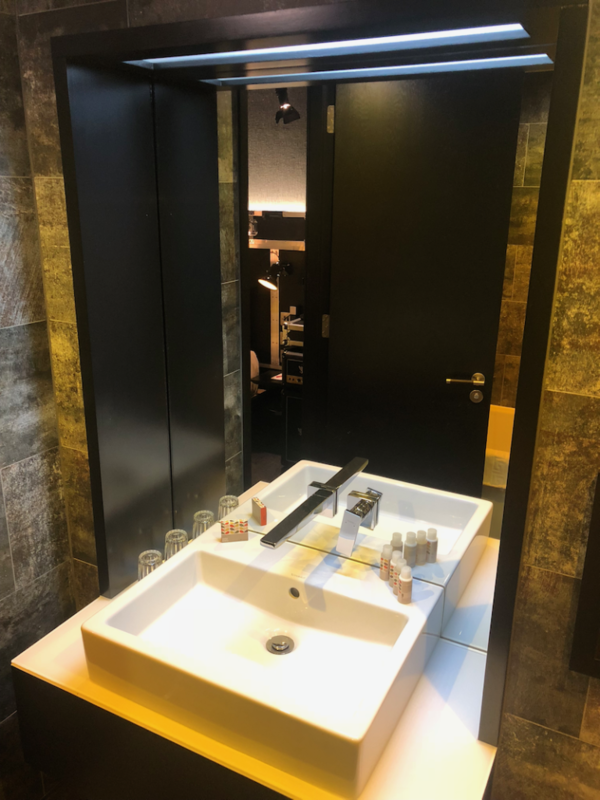 These rooms combine a dark and seductive mix of highly tactile surfaces on all walls, floors and ceilings in a palette of black, charcoal and silver. An eye popping acid yellow is used across the curtains, cushions and bed throw that could have come straight a Vivienne Westwood pair of punk trousers I loved it! While ceiling spotlights on rails with barn door flaps allow you to manually customise the bedroom lighting. 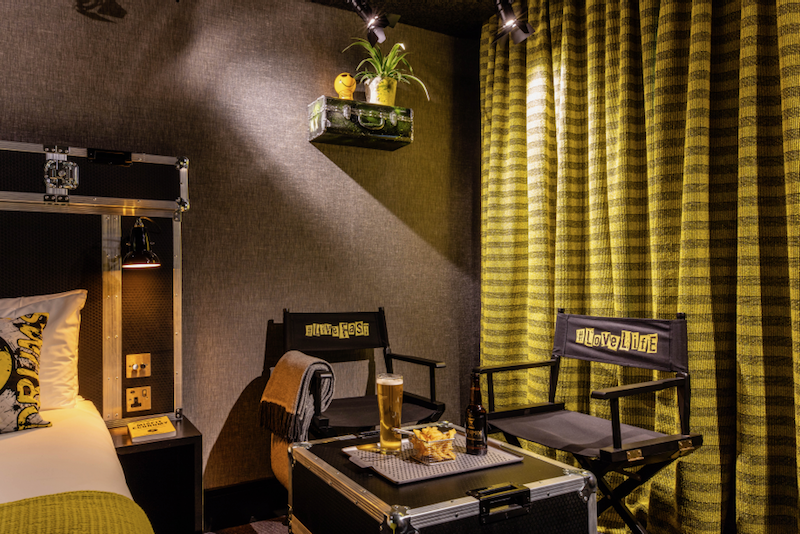 Following the acid yellow there, the director’s chairs are printed with customised graphic hashtags evoking English music subcultures such as punk, indie rock and ska. 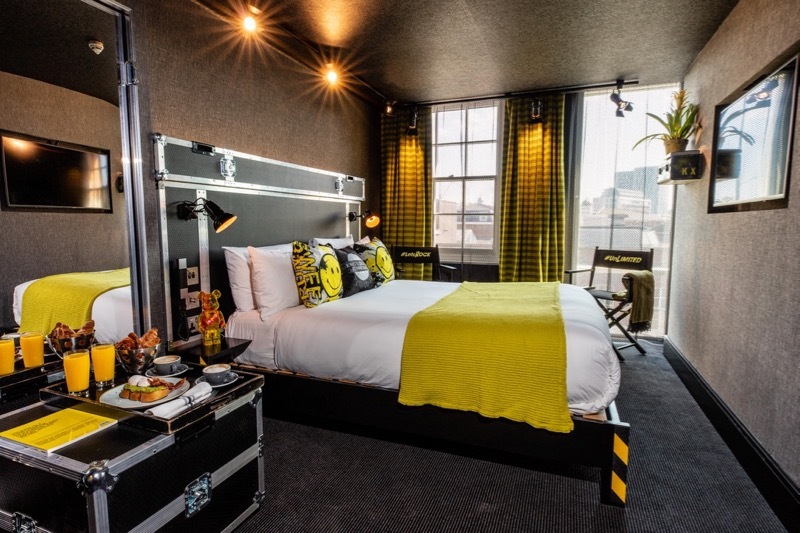 Individually designed beds, mobile wardrobes and occasional furniture are made with flight-case materials, lending an edgy urban nomad feel to the room as if the set has just been unloaded from the trailer or private jet of a DJ or band on a world tour. 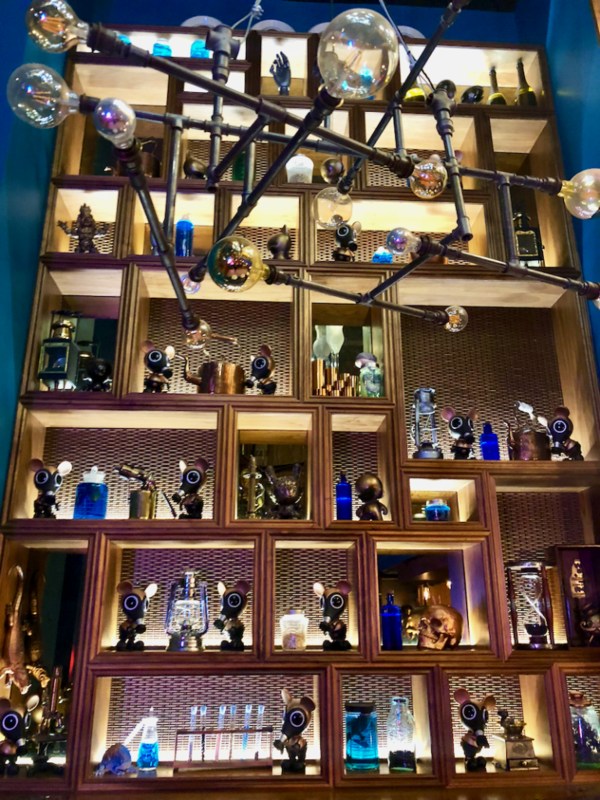 The room also included a number of curated British-made iconic objects such as a bar fridge clad within a Marshall amplifier, Anglepoise bedside lamps and pressed aluminium trays made by Kaymet in London since 1947. 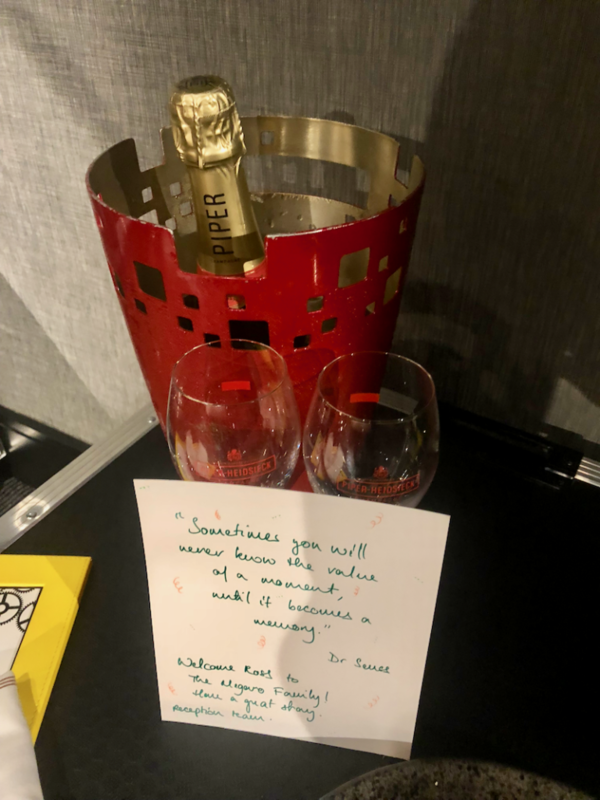 I loved the welcome chocolates which were handmade and the bottle of champagne was such a nice surprise! 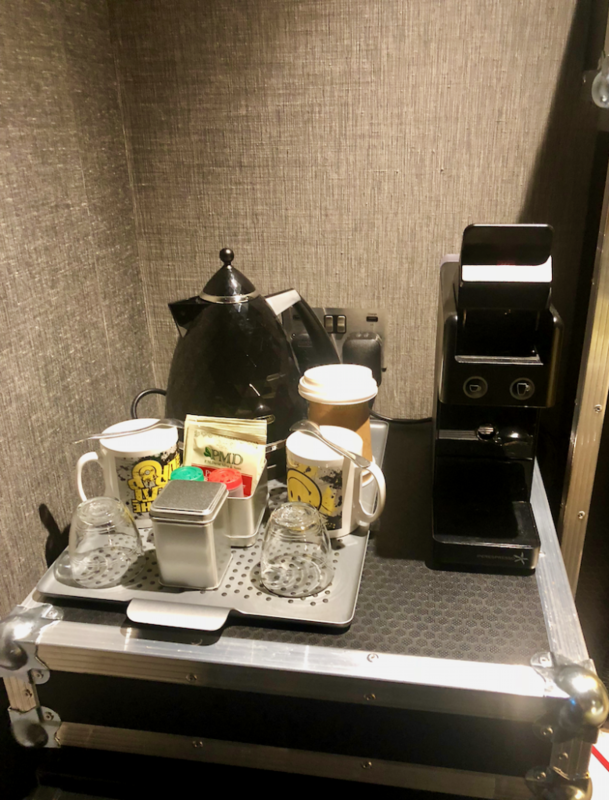 Rooms come with a trusty coffee maker! 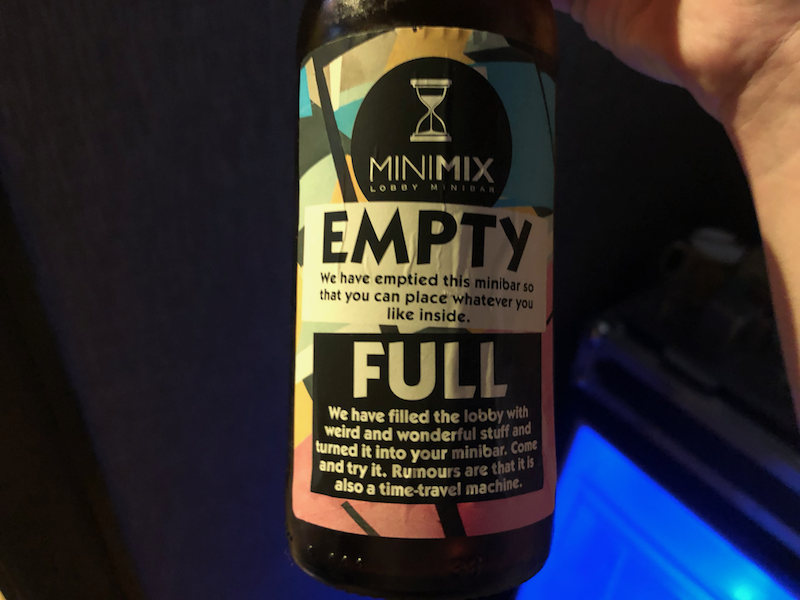 And the minibar fridge prompts you to head down to the lobby to stock up on snacks. 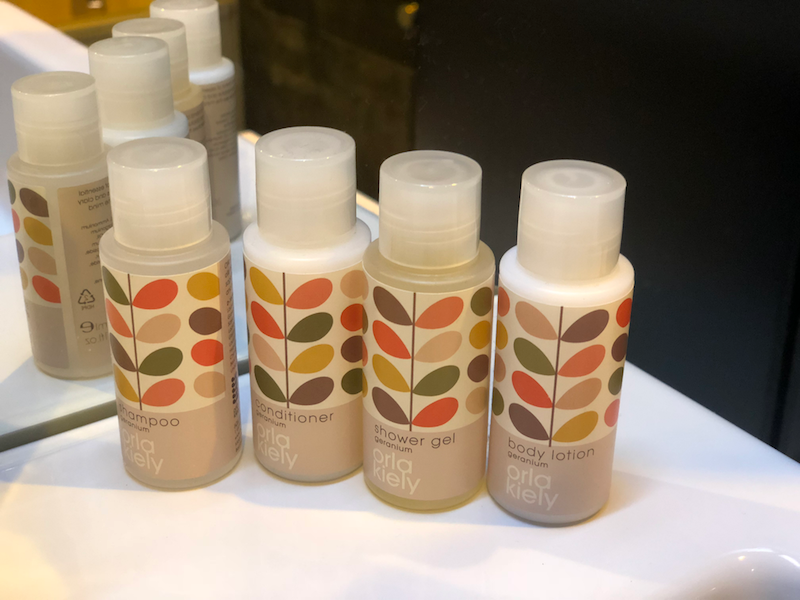 The Orla Kiely bathroom products were divine! 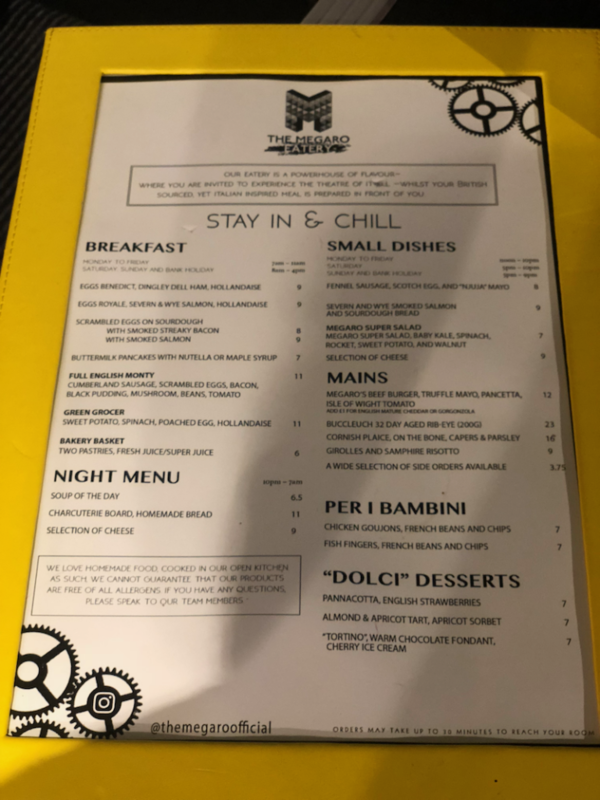 I don’t normally order room service as I like to eating in the restaurant, but I was short on time in the morning so went for the Eggs Benedict, which was actually one of the best I have had to date! I arrived at the hotel not knowing what to expect and left a BIG fan! 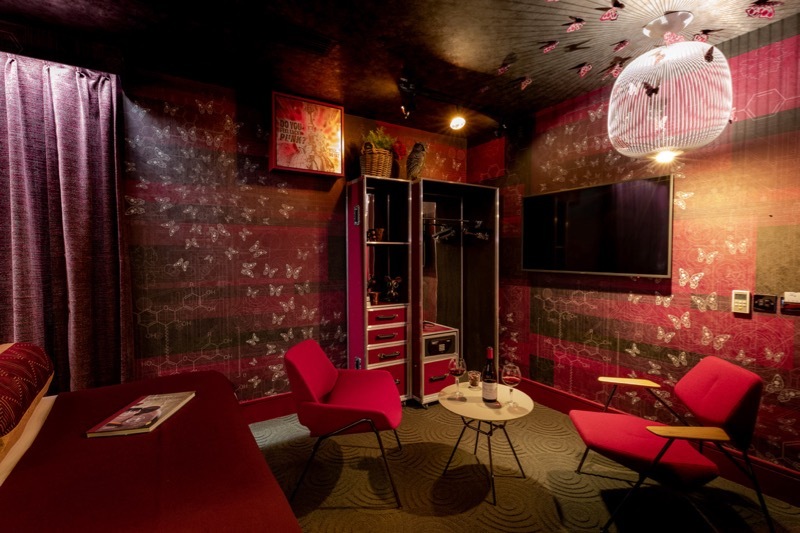 The hotel really is fun, they have got the mix of quirkiness blended with a professional hotel experience just right. The staff are incredibly friendly and the new rooms in the property really are something quite special.